Sports fashion has been evolving for the past few years. If you think about it, we've been rocking the trend for quite some time now. That cap you threw on to finish off the look (and to make it tumblr worthy), the hoodie you put on top of your floral dress for extra comfort and warmth, that white pair of sneakers you haven't been able to take off for the past few months; it all adds up. Hints of the trend have already marked presence in our day to day outfits, and inevitably sporty fashion grew with it. The division between style and comfort got blurred in the process and sporty outfits have became the norm of daywear. 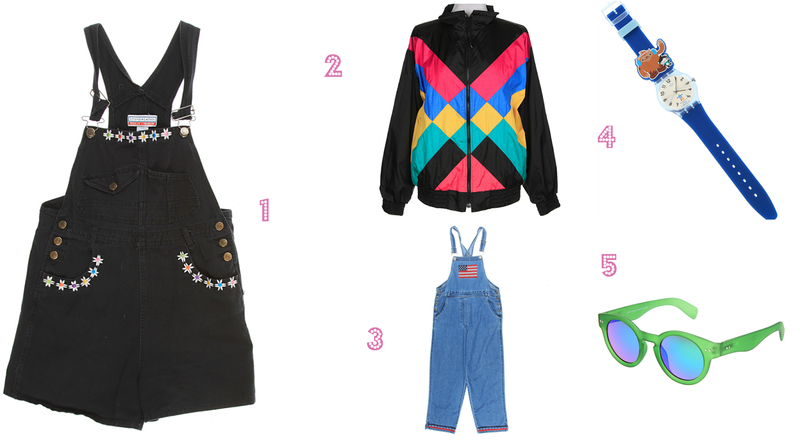 The athletic influences have certainly grown and here's a few ways you can style this trend with some gorgeous vintage pieces from Rokit, because what's better than keeping it sporty AND retro?! 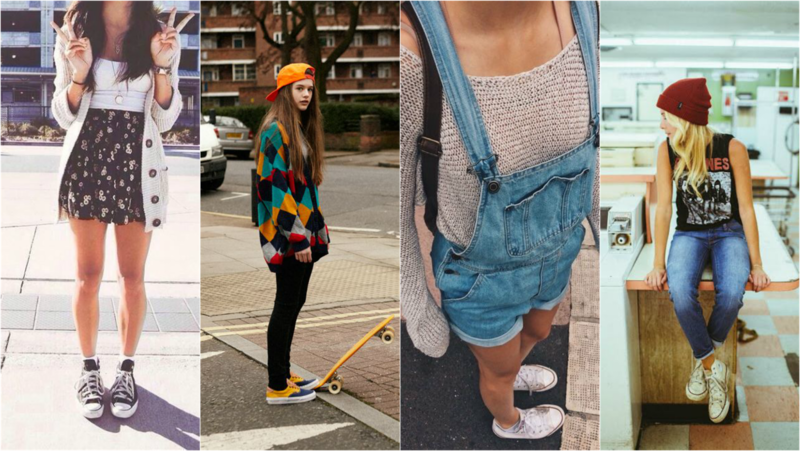 Think graphic vintage tees, beanies and vans; dressing up like the kids from the skate park just got cool. And if you think the all over skater look is a little too much, there is absolutely nothing wrong with pairing a mini floral dress with some vans and a cap. The key is to have fun with the trend as it allows you to mix and mismatch different pieces and still look damn cool. A comeback from the '80s! Slogan wear not only is trendy, your clothes can do all the talking for you. And just like the skater look, the slogan head-to-toe is too much information hence a feminine touch is always the way to go. A slogan top or jumper work well with full skirts or skinny jeans, add some chic heels and off you go! And if the above sound a little too immature to you, the sporty trend works perfectly well with silver, black, navy and white; you know the "grown-up" shades. Bodysuits are very cool and are basically in any shop you will walk in, plus they're great for the day paired with culottes and simply add a leather jacket for a night look. Finish off the look with a cool bumbag or black bomber jaket. Bomber jackets were hot this season and they are not going anywhere in the fall! Whether you're off to a day out shopping, the next big festival or a night out with the girls, there's a whole new way to get dressed; sportscore is here to stay and I am loving the trend! What about you? 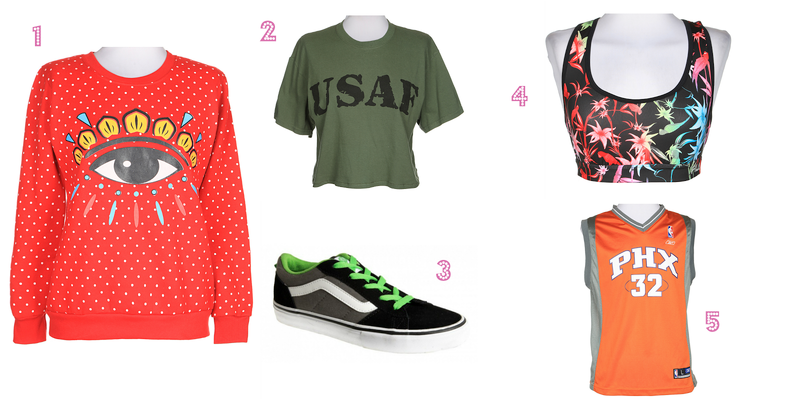 Let me know below what your thoughts are on sporty fashion! Also, check out Rokit for some really awesome one-of-a-kind vintage items! *Sponsored post. All opinions are my own (disclaimer here). Outfit images from Pinterest, all collages made by me. Love the things you selected. I especially like the black clothes. Duh, you just can't go wrong with black, can you? Great and inspiring selection, Pam. I think mine would be similar to sleek as the other two styles are a touch too young for my taste...or I'm just getting really old. LOL! Great post, full of inspiration!! thanks for share it!! I don't think I'm cool enough for these trends!! I'll have to give them a go! I feel the exact same way so often! I'm always trying to gather the courage! Skater mixed with some sleek is definitely my favourite look! These outfits are the ones that I appreciate the most, and I love the ones you chose! I think sporty sleek is my fave. All these outfits look great! I love easy wear outfits, that you can just throw on in minutes! Love these styles and sets you have made, especially skater and sleek! I really got into sporty fashion after I had the kids. All about comfort and ease! Wow! They all look stunning! Lovely post. I love love love this trend Pam. My favorite the sneakers. I could live in them but first I need to get myself to invest in some good ones. They are just so comfy, what's not to like. Beautiful images. All outfits are awesome.nice post. Nice selection! I love those vintage clothes! I adore my mothers photos wearing this style!